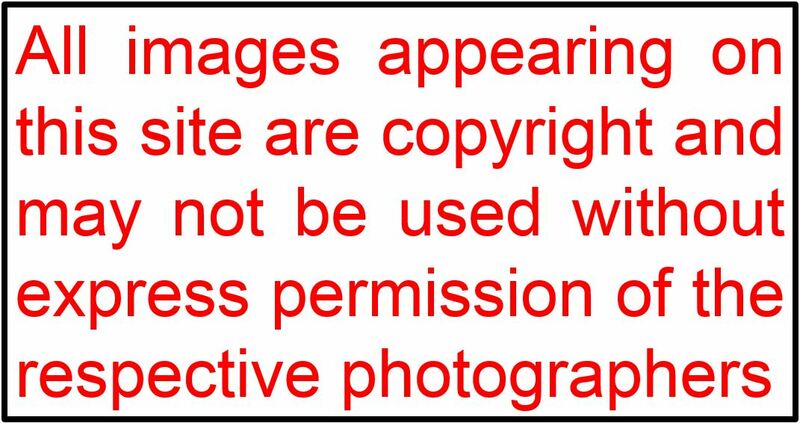 Following the occurrence of a pale redpoll sp. (Mealy or Lesser) in my garden recently, Neil McMahon offered to come along and set up his mist-nets in an attempt to trap and identify the bird. If he didn’t trap it then no problem as there are plenty of other finches – mainly Siskins – visiting the feeders, providing an opportunity to ring a good quantity of birds. Neil arrived on Monday (25th February) and netted eleven Siskins and ten Lesser Redpolls during a four-hour stint. Unfortunately the pale bird did not reappear, although two similar, less striking birds put in an appearance on a couple of subsequent occasions so, as I was working from home, we decided to give trapping another go today. I left Neil to it, occasionally popping out to see how it was going. Fewer birds were trapped but they included this relatively pale individual. Looks a little cold and frosty, doesn’t it? It also has a good white greater covert wingbar, apart from a couple of light brownish outer feathers but the supercilium, although not buff, is not particularly prominent. 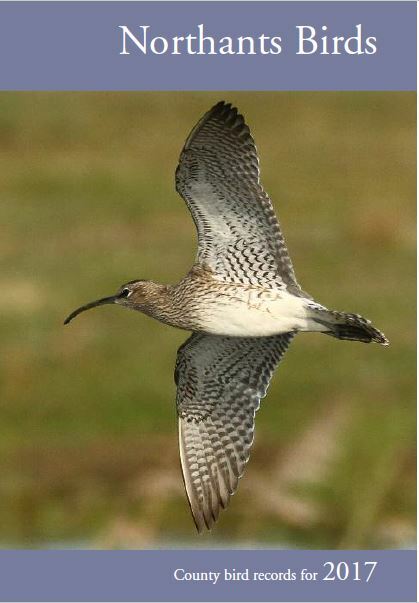 From the rear, the mantle and rump have a whitish ground colour, although the sides of the mantle and scapulars are warmer and the upper tail coverts are tinged buff. The nape is also very pale. In an oblique side view the bird looks more extensively brown but, from the front, there is sparse flank streaking and none of the strong buff hues we normally associate with Lesser Redpoll. The supercilium also looks more prominently white; it just goes to show what a difference viewing angle makes! 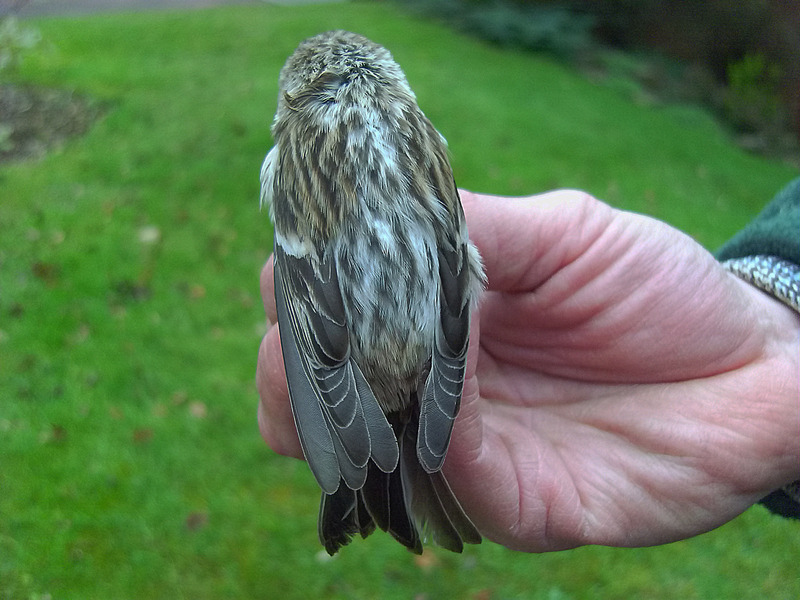 Many of these features are shared by Mealy Redpoll but this bird, on biometrics, is indisputably a male Lesser Redpoll and the pointed and slightly abraded tail feathers indicate it is a first-year. 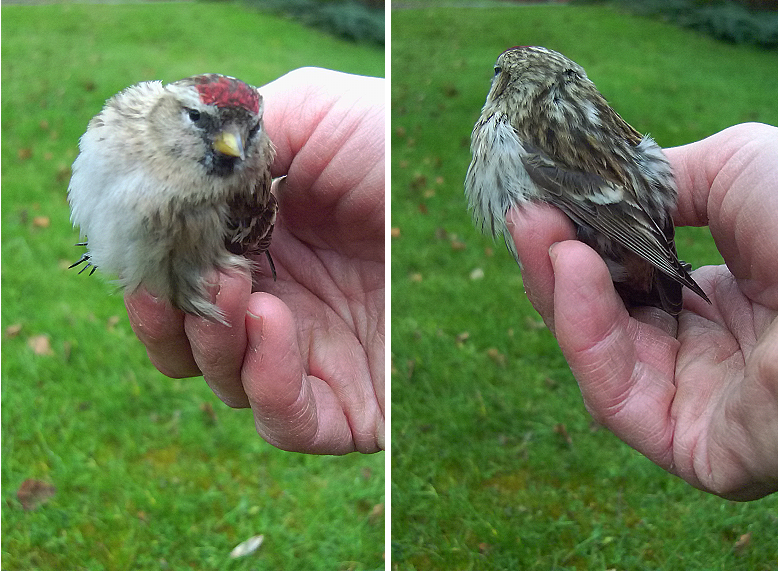 I have seen ‘worse’ Mealy Redpolls than this but the above images serve to illustrate the difficulty with identifying redpolls when confronted with something which deviates from the standard. 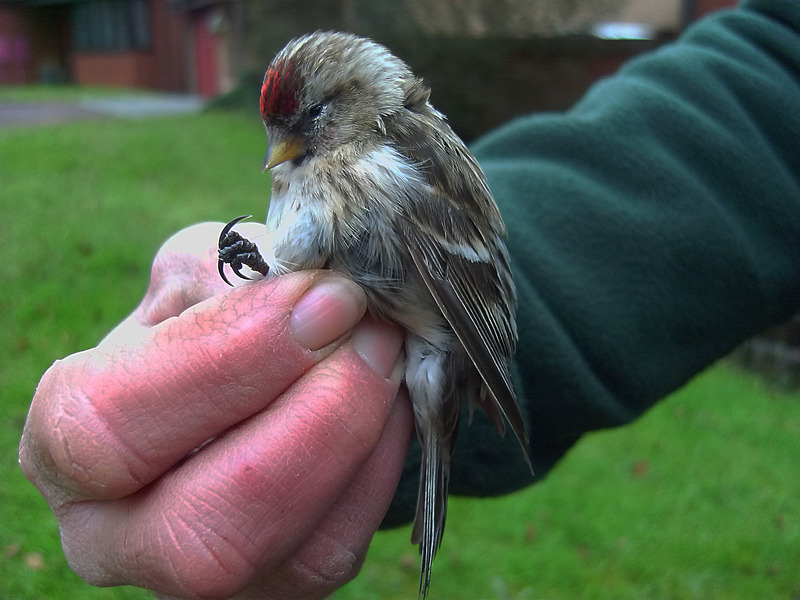 Lesser Redpoll is very variable (and so is Mealy) and this fact should not be underestimated when observing birds in the field. 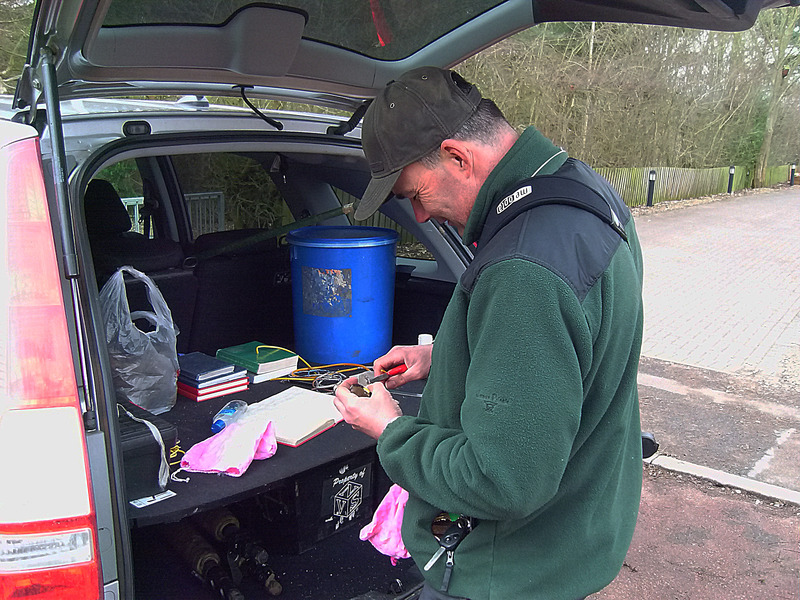 Neil at work, processing a Goldfinch. The back of a four-wheel drive doubles in this instance as a mobile ringing station! Many thanks to Neil for his time and efforts this week. two redpoll’s on Wellingborough Embankment today, feeding on the seedheads just before the blue bridge. Thank you for the redpoll articles,extremely informative and very interesting.